6 S C T / A P R I L 2 0 1 8 T H E C O M M O N A R E A N E W S F R O M A LL C O R N E R S O F T H E I N D U S T R Y HIGH YIELDS IN SECONDARY MARKETS 8 IMAGINATION'S THE LIMIT WHEN FILLING A FORMER MACY'S 10 WHY SELF-STORAGE OPERATORS LOVE RETAIL SITES 12 2017 SAW GREAT NOI AND OCCUPANCY GROWTH 14 I CSC's most recent North American compensation survey covers pay and incentives at 71 retail real estate companies. 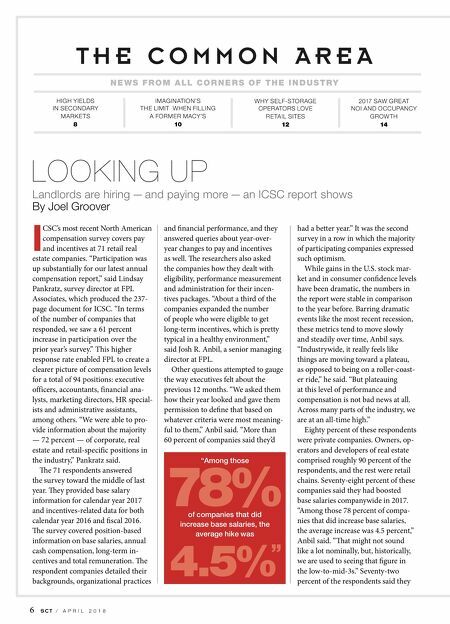 "Participation was up substantially for our latest annual compensation report," said Lindsay Pankratz, survey director at FPL Associates, which produced the 237- page document for ICSC. "In terms of the number of companies that responded, we saw a 61 percent increase in participation over the prior year's survey." This higher response rate enabled FPL to create a clearer picture of compensation levels for a total of 94 positions: executive officers, accountants, financial ana- lysts, marketing directors, HR special- ists and administrative assistants, among others. "We were able to pro- vide information about the majority — 72 percent — of corporate, real estate and retail-specific positions in the industry," Pankratz said. e 71 respondents answered the survey toward the middle of last year. ey provided base salary information for calendar year 2017 and incentives-related data for both calendar year 2016 and fiscal 2016. e survey covered position-based information on base salaries, annual cash compensation, long-term in- centives and total remuneration. 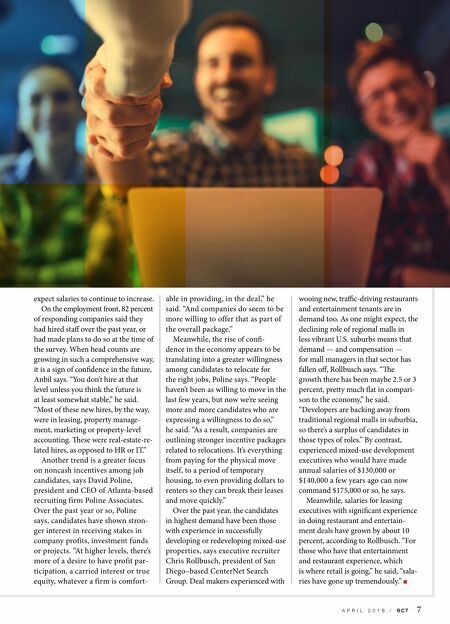 e respondent companies detailed their backgrounds, organizational practices and financial performance, and they answered queries about year-over- year changes to pay and incentives as well. e researchers also asked the companies how they dealt with eligibility, performance measurement and administration for their incen- tives packages. "About a third of the companies expanded the number of people who were eligible to get long-term incentives, which is pretty typical in a healthy environment," said Josh R. Anbil, a senior managing director at FPL. Other questions attempted to gauge the way executives felt about the previous 12 months. "We asked them how their year looked and gave them permission to define that based on whatever criteria were most meaning- ful to them," Anbil said. "More than 60 percent of companies said they'd had a better year." It was the second survey in a row in which the majority of participating companies expressed such optimism. While gains in the U.S. stock mar- ket and in consumer confidence levels have been dramatic, the numbers in the report were stable in comparison to the year before. Barring dramatic events like the most recent recession, these metrics tend to move slowly and steadily over time, Anbil says. "Industrywide, it really feels like things are moving toward a plateau, as opposed to being on a roller-coast- er ride," he said. "But plateauing at this level of performance and compensation is not bad news at all. Across many parts of the industry, we are at an all-time high." Eighty percent of these respondents were private companies. Owners, op- erators and developers of real estate comprised roughly 90 percent of the respondents, and the rest were retail chains. Seventy-eight percent of these companies said they had boosted base salaries companywide in 2017. "Among those 78 percent of compa- nies that did increase base salaries, the average increase was 4.5 percent," Anbil said. "at might not sound like a lot nominally, but, historically, we are used to seeing that figure in the low-to-mid-3s." Seventy-two percent of the respondents said they Landlords are hiring — and paying more — an ICSC report shows By Joel Groover LOOKING UP 78% 4.5% "Among those of companies that did increase base salaries, the average hike was "